Found dog on Worchester Ln near Hereford Dr. Small tan/gray short haired dog. Photo attached. Owner has contacted our agency and is in the process of being reunited! 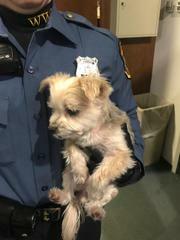 A small short haired tan/gray dog was found on Worchester Ln in the area of Hereford Dr this morning by a passing motorist. If you have any information as to who this little guy owns, contact the West Windsor Police Department @ 609-799-1222.